Hier kun je al je overige zaken kwijt ook als die niets met Smurfengames te maken hebben. We just created it for FUN and because we thought it looks nice, but ofc we don´t want to keep it for urselfs! It´s a silver-tag, which costs 3000 1500 planets for me to send it to somebody. Edit: Since 20 November Hype created an organisation. So if you want a Smurftag, it will only cost you 1500 Planets. 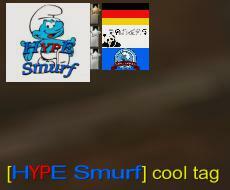 If you want a Smurftag, contact Hype! Nah no tag for me Hype, everytime i'm online i'll give my planets (just the few i got at that given moment) to the server. WilloW wrote: Nah no tag for me Hype, everytime i'm online i'll give my planets (just the few i got at that given moment) to the server.